Scientists have found that these worms self-assemble into structures that allow them to survive on broad, sandy beaches. One of the phases of this self-assembly is a big, floating worm spiral. The mint sauce worm, Symsagittifera roscoffensis, is commonly studied in labs. It serves as a simple model for how symmetric animals develop, and how stem cells affect that development. It’s also easy to cultivate, and thrives in big groups. 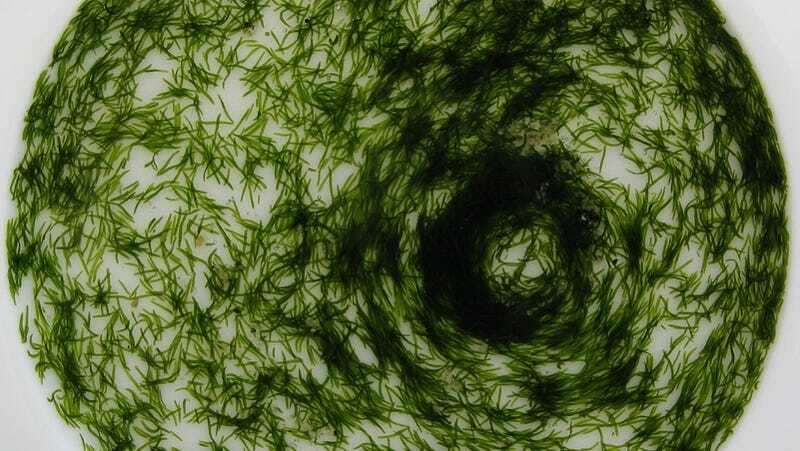 Now, in Proceedings of the Royal Society B, scientists from the University of Bristol are describing the behavior of those big groups—and have found the process that allows these worms to self-assemble into a kind of free-floating seaweed. The mint-sauce worm is already close to a plant. If the adults’ organs weren’t colonized by algae, they’d be clear. They’d also be dead. The worm lives entirely off the nutrients provided by the photosynthesizing algae. To allow the algae to photosynthesize, it leaves its home in the sand at low tide in the day and basks in the sun. The worms only live in tide pools, where they are protected from the current, but being only three millimeters long, they have neither defenses nor much of a choice about where errant water currents push them. This leads to an interesting social behavior. It’s been observed before. Here is a group of worms inside a pool of water in a shell. But while ants in structures like these are engaging in self-destructive behavior, the mint-sauce worms are forming something useful. They’re becoming what the researchers call a “super-organismic seaweed,” which could float as one body, deter predators looking for worms, and horrify beach-goers who want to dabble their feet in the water—only to find it full of worms.